We often look at India’s Coffee forests as a self-sustaining ecosystem closely interlinked with various biotic partners. A microscopic look reveals that all life, both above ground and underground, inside coffee forests is connected to the web of life. We make it a point to look at the larger picture and stimulate our imagination to find answers in understanding the power of nature and complexity of life that drives a healthy coffee ecosystem. In doing so, it is as if the forests teach us something that they owe us! The interactions both big and small has enormous implications with coffee, the primary commercial crop along with multiple crops like pepper, areca and orange, herbs, shrubs and forest trees and more importantly with the close knit community that holds the forest sacred to their very existence. 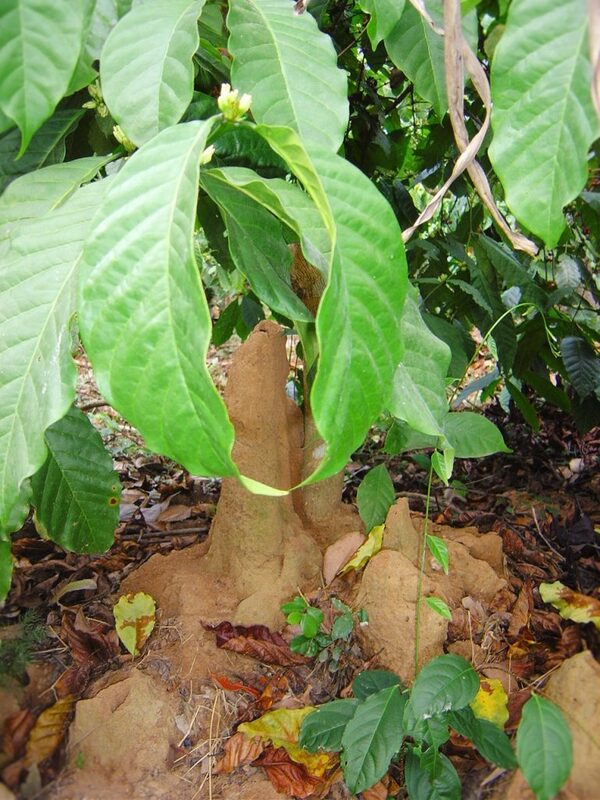 The point that we would like to make in this paper is that most of the new age Coffee Planter’s look at termite mounds inside their Plantations as detrimental for the growth and development of Coffee and multiple crops. In fact there seem to be more questions, than answers when it comes to understanding the role of Termites inside coffee forests. Scientific literature clearly indicates that termites act as indicators of the health of an ecosystem and their mounds provide vital clues about the ecology of the region. They are indeed architects of change. In the past one decade, Indian Coffee forests has undergone a sea change in terms of land use change and pattern of diversification. Enterprising Coffee Planters have tried out various models like the Brazilian method of planting (Open coffee monoculture), some have tried to dedicate a few blocks, only for Pepper Cultivation and some others have gone with the traditional agroforestry system. It is clearly understood that these vibrant models of cultivation has brought in major ecological changes inside the coffee ecosystem. Some of them desirable and some unwarranted. In our personal opinion, changes in land use and intensity of planting multiple crops at the cost of felling down native and introduced trees, plays a major role in the destruction of habitat. This accelerates the biodiversity decline and also snaps vital links in the chain of sustainability. Ultimately, the carrying capacity of a supportable ecosystem collapses bringing in large scale pest and disease incidence. The overall health and function of the ecosystem is compromised. In order to detect undesirable changes, we need to identify a set of indicator organisms that are sensitive to any land use changes. One such indicator organisms are the termites. 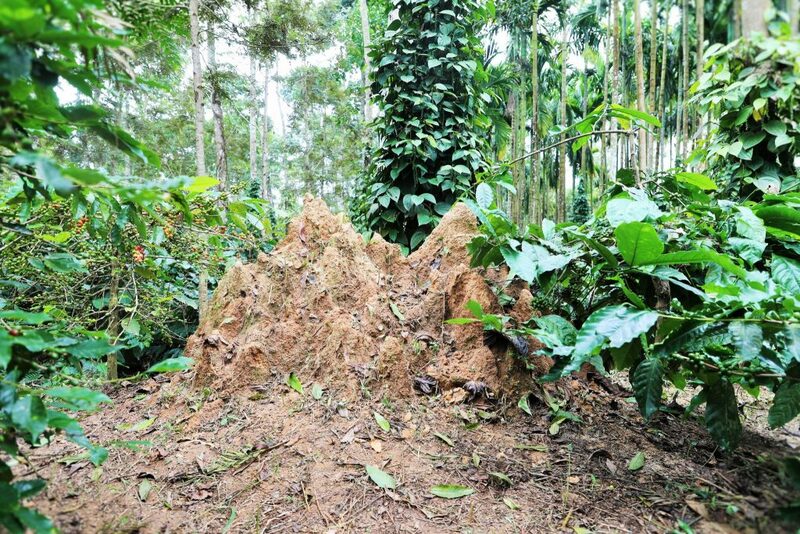 Even though the study regarding termites inside coffee plantations is poorly understood, it is a fact that termite’s ecological behaviour is much affected by land use change and degree of disturbance level. Scientific literature clearly points out to the fact that diversity in termite variation in any given ecosystem can be exploited as a bio indicator tool to determine the environmental quality of the ecosystem. There are more than 3,000 species of termites in the world of which around 400 are found in Asia. In India, 26 species of those are considered as pests. A total of 170 species of termites is endemic to India which represents roughly two-thirds of the total to 253 species so far known from India. Maximum concentration of 73 species occurs in the tropical rainforests in the Western Ghats which is considered as one of the 15 mega diversity provinces of the world. Despite all the damage and destruction termites have wreaked since almost the beginning of time, these ant-like insects are actually beneficial in nature, aiding in the decomposition of dead and decaying wood and the return of nutrients to the soil. Termites are detritivores (Detritivores, also known as detrivores, are heterotrophs that obtain nutrients by consuming detritus (decomposing plant and animal parts as well as feces). Often observed on dead and decaying woody material like logs of wood or standalone trees, termites are efficient nutrient recyclers which colonize dead and decaying organic matter on the floor of the coffee forest. They form an important link in the cycling of nutrients in the forests by breaking down fallen down twigs, leaf litter, logs of wood and other organic residues on the ground, which would otherwise take years to decay by microbes. Termites help speed up organic matter decomposition by breaking organic waste into smaller pieces, so increasing the surface area for the bacteria and fungi to act upon. Termite mounds are commonly found in the forests of southern India. There are two types of mounds based on their shapes — lenticular and cathedral. Lenticular mounds are largely underground with a large dome-like shape, while cathedral mounds are tower-like structures. Dampwood Termite. Zootermopsis spp. and Neotermes spp. Drywood Termite. Cryptotermes spp. and Incisitermes spp. Subterranean Termite. Reticulitermes spp., Coptotermes spp. and Heterotermes spp. 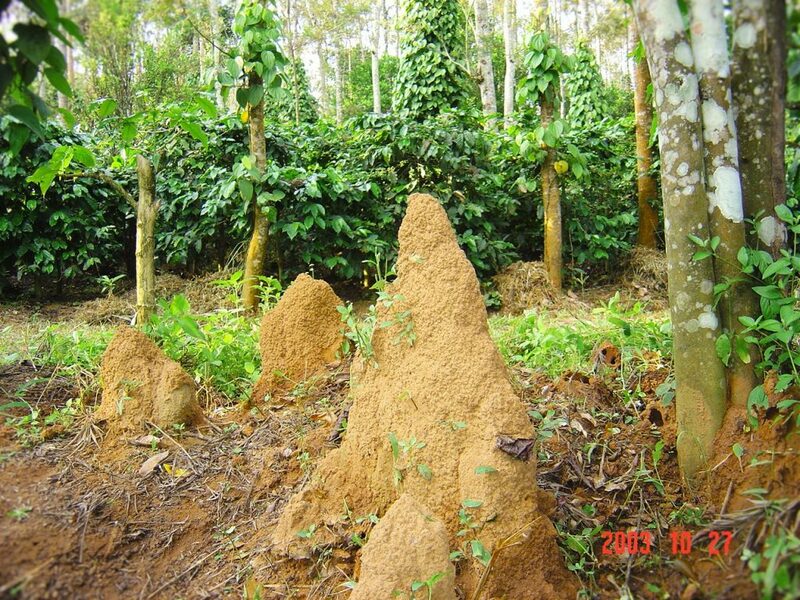 The first step would be to obtain data regarding the type of termite mounds that already exist in the Coffee Forest. 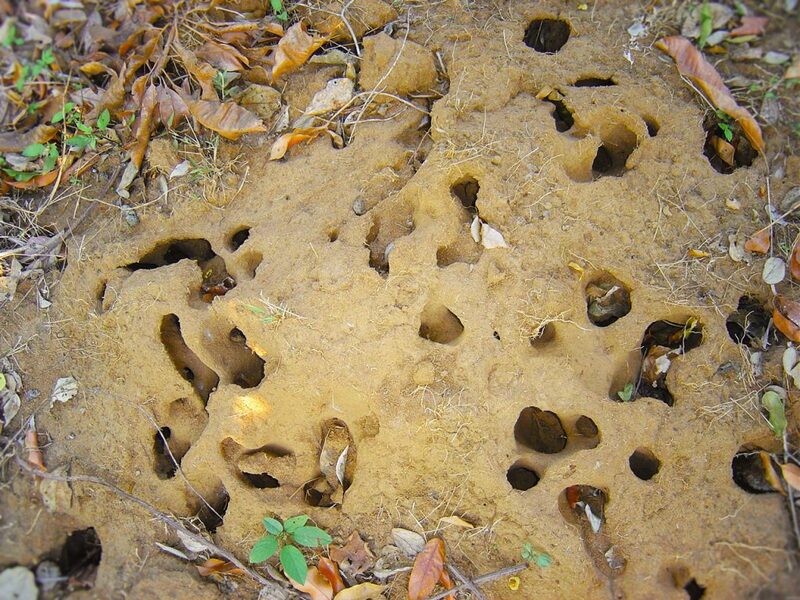 The survey should include termite specie’s richness and evenness, relative abundance and biomass. Subsequent land use pattern change will give a clear picture in terms of decline in termite diversity. The actual increase or decline in population and species richness can be used as an environmental bio indicator to detect habitat disturbance. The Coffee forests is a mosaic of a variety of tree species. Because of the high heterogeneous population of trees consisting of hardwood, jungle wood and semi hard wood species, there is plenty of food available in terms of cellulose. The food of termites is mainly cellulose, which is obtained from wood, grass, leaves, humus, manure of herbivorous animals, and materials of vegetative origin. Lower termites and many higher ones feed on wood that is either sound or partly decayed. Termites cannot directly “eat” wood. Termites require the help of single-cell organisms in their guts to digest cellulose (wood). Cellulose digestion in lower termite families depends upon symbiotic flagellate protozoa, which live anaerobically (without oxygen) in the termite hindgut and secrete enzymes (cellulase and cellobiase) that break down cellulose into a simple sugar (glucose) and acetic acid. The termites depend entirely on protozoans for cellulose digestion and would starve without them. A few termites, known as foragers or harvesters, collect and eat grass, leaves, and straw. Many higher termites (family Termitidae) are humivores, or exclusively humus feeders. Due to the large population of trees inside coffee forests, termites may attack trees whose resistance to damage is low but generally ignore fast-growing plants. Most attacks occur at harvest time; crops and trees are attacked during the dry season. Moreover, shade regulation during the peak summer periods helps termites to act on the biomass. The local communities use mounds as an indication of ground water presence. Many Planters dig bore wells close to termite mounds because they feel that the mounds indicate the presence of water. How far this is true is yet to be ascertained. More studies need to be carried out. However, our experience tells us that there is a definite correlation between termites and water availability. Scientific literature has provided in depth studies of termite nests. Generally it consists of the inanimate and the animate. The outer structure consists of the inanimate and the termite colony residing inside is the animate part of the nest. Nests can be broadly separated into three main categories: subterranean (completely below ground), epigeal (protruding above the soil surface), and arboreal (built above ground, but always connected to the ground via shelter tubes. [Scientists] found that each mound supports a dense aggregation of flora and fauna which grows more rapidly the closer to the mound it is. Conversely, animal population and reproductively noticeably declined at greater distances from the mound. One of the primary causes of this phenomenon is believed to be the actual construction and maintenance of the termite mounds. The workers bring up relatively coarse particles to be deposited on the otherwise fine soil. The coarser particles aid in the absorption of rainwater into the soil and discourage movement of topsoil in response to precipitation and drought. The mounds also contain a high level of nitrogen and phosphorous, nutrients that enhance plant growth. An in depth study needs to be carried out to assess the ecological role of termites inside coffee forests. In fact, studies on Termite mounds in Africa clearly indicates that in African landscapes, termite mounds are called ‘hotspots of fertility’ or ‘nutrient patches’ and they increase plant and animal diversity in the ecosystem. 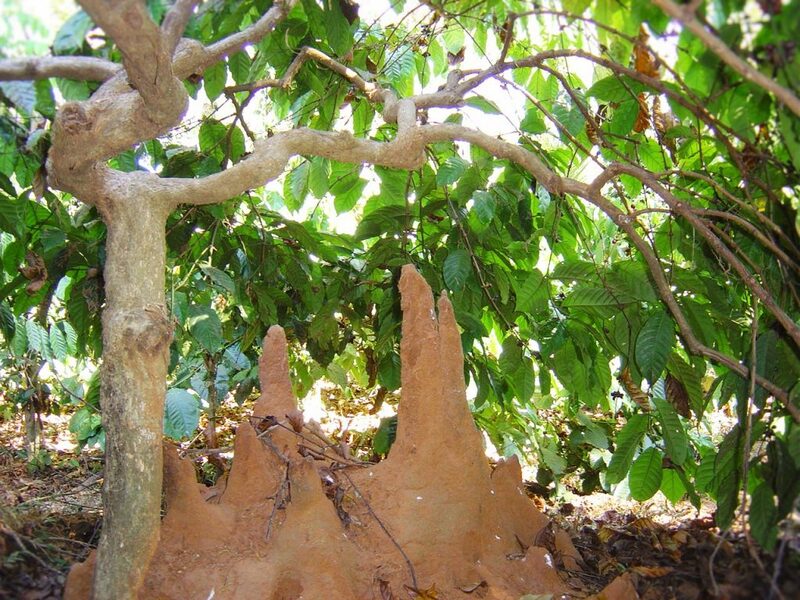 Studying the distribution and abundance of termite mounds may provide vital clues with respect to nutrient recycling and soil dynamics inside the coffee ecosystem. Different species of termites behave differently in varied soil agro climatic conditions and since coffee soils vary from block to block within a given Plantation, it is of paramount importance to understand species specific termites and how they act on each species of trees and how they influence soil properties, erosion, soil fertility, carbon storage, water infiltration, etc.